At this point, it goes without saying that I've become a big fan of Chicago rapper/producer Bless 1. I've previously put up tracks of his here and here (those of you particularly observant may have noticed a similar photograph used for all three posts -- Bless, you need to invest in a digital camera!). Today, Bless hit me up with his latest track, Starving Artist. Along with handling the lyrical duties on the song, he produced the beat, featuring a classic sample from Doug E. Fresh and Slick Rick. I would be feeling this track regardless, but adding in a sample from The Show certainly didn't hurt. On Starving Artist, from his upcoming collaboration album with French producer Rhythm From Art, Bless covers a subject near and dear to the heart of every underground rapper: the struggle to get on. He's certainly not the first artist to rap about the difficulty of making a living off of the music, but its impossible to listen to this track and not appreciate just how genuine his words sound. Lots of rappers talk about their "hustle," but too often it ends up being a tired metaphor for their alleged maneuverings in the drug game. On this track, Bless tells us about his legal hustle and the result is much more impressive. As he says in his lyrics, "The straighter the path, the harder the gravel." Bless says that he prefers making beats to rapping, but it would be a shame if he put down the mic for good. Some of the best albums in hip hop have come from MCs who were more interested in the production side of things - Havoc and Dr. Dre being the first two examples that come to mind. Here's hoping that he continues to write a few rhymes in between his time behind the boards. 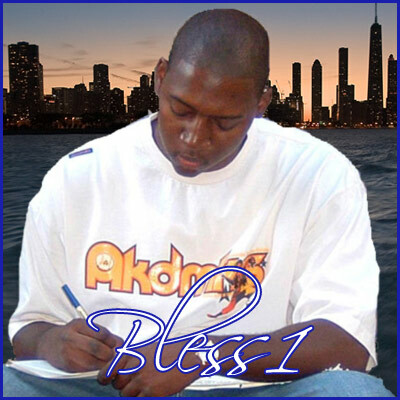 For a few of Bless 1's older tracks that haven't been featured on this site, hit up his profile on download.com, and then check out his MySpace page.